Yuvraj Motors – Z-5, Flower Valley Shopping Complex, Eastern Express Highway, Service Road, Thane (west), Thane. Aarav Automobiles – Shop no. 5 to 11, Ground floor, Yashwant Arcade CHS Ltd, Plot no 56-58, 90, Sector 6, Koparkhairane, Navi Mumbai. Yuvraj Motors – Shop no 4 & 5, Ground floor, Shripal Building, Chhaya Co-operative society Ltd, V.N. Purva Marg, Chembur, Mumbai. KK Motors – Building no B264, Ground floor, Blue heaven building, 30th road, TPS lane, Behind Trupti, Bandra (West), Mumbai. Customers in and around Mumbai can now walk into any one of these showrooms to feel and look the new Jawa bikes and put down a deposit for one. Although sold out till September, Jawa will still be taking booking but only through their dealerships but be ready for a long waiting period. Currently, Jawa offers two motorcycles, the Jawa and the Jawa 42 in two variants and with a range of colour options. The bikes use a 293 cc engine which uses a DOHC set-up and liquid cooling. The single cylinder motor develops 27 hp of peak power and 28 Nm of maximum torque. Special attention was given to the engine and it produces a flat torque and a sound as close as the iconic 2-stroke engine of the older Jawa motorcycles. While both bikes get single channel ABS as standard with a drum brake, a dual channel ABS system with dual discs can be equipped for a little extra. 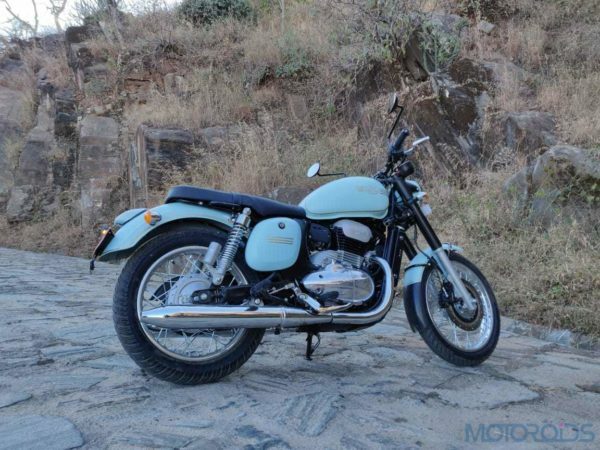 The prices of the Jawa start at INR 1,64,000 and that of the Jawa 42 start at INR 1,55,000.